When I arrived at Uganda’s Entebbe airport, Simon, HORD’s founder, was waiting for me. His smile was even bigger than mine – and mine was pretty big. 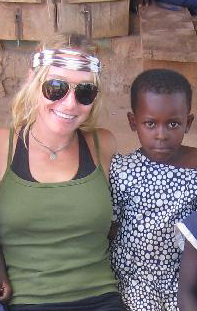 I had made it to Uganda and I was confident that I was going to make a difference! Once at my guesthouse in Kampala, Simon sat me down for a presentation. He wanted to prepare me for what awaited me in Uganda’s Kamuli District, HORD’s service area. Within thirty minutes my smile, and every last drop of my confidence, had vanished. He told me about the extreme poverty and all the obstacles to education. He said I would see graves behind every home and that many of them would be child-sized. He told me about all the widows and then showed me a picture of a widow. She had lost her husband and her 2 co-wives to AIDS. She now had 16 children to care for, and no way to do so. She had no income and no skills. She was infected with HIV. Lastly he told me that I would see many “closed homes,” homes that had simply been boarded up because every member of the family had died. That night I went to my room and cried. I cried for the widowed women, for the orphaned children and the seeming hopelessness of it all. Much as I hate to admit, my tears were also laced with self pity. I didn’t think I was tough enough to endure it. I no longer believed I could do it. Yet I had no choice. I had to go to Kamuli. But I was absolutely terrified. The next day Simon and I traveled the 4 hours from Kampala to Kamuli. The last phase of the journey was on motorcycle taxis, down a red dirt road lined with crumbling mud huts and an occasional brick home – boxes really. The previous night’s tears were gone, but with each mile my fear grew. As we drove I thought I heard banging. When the motorcycle began to slow, I realized the banging was the beating of a drum. I spent three weeks as a HORD volunteer. During that time HORD negotiated 25 scholarships, cleaned out 2 water sources, and helped convict a known child abuser. Each and every day HORD brought hope to the community and to me. My first night in Uganda aside, I’m not usually a crier. But I did cry one more time; it was the day I left. Simon had repeatedly told me that none of the orphans feel like orphans, that he “wants them to feel like a family.” And I know they do. Because when I left Kamuli, I wasn’t just leaving a community, I was leaving my new family. If you are considering becoming a HORD volunteer, I would happy to share my experience with you and answer any questions you may have. Please feel free to contact me: Erin Milgram at erinrosemilgram@gmail.com.